Seven games, 13 goals, heavyweights clashing and a big shock. I'd say Match of the Day is worth a watch tonight. It's live now on BBC One and at the top of this page. Time for us to stop waffling so you can watch it in peace. If you want to keep tabs on the last-minute deadline day deals, head here. "My phone's buzzing in my pocket so I'll check in with him [chairman Steve Parish] when I get on the coach, We've been interested in a couple of players, whether we have or not I don't know." How difficult is it to have a game on TDD? "The hard bit is the distraction. I had a player asking me today if I'd put him up for sale - that's what you get with this godforsaken window, players being told things which aren't true, that shows you just how bad this window is, having a game on the last day." What will new signing Luka Milivojevic bring to the side? "He's a defensive midfield player with great ability with both feet and ability to pass the ball. Sitting in midfield - this lad loves that position, it's his main position. I'm looking forward to working with him. With Patrick van Aanholt and Jeffrey Schlupp as well, we've added quality to the squad which can hopefully bring us better results." West Brom manager Tony Pulis: "The penalty changed the course of the first half. We were comfortable and had chances to get a second. I don't think it is a penalty. Negredo is a big lad and puts himself about. He drops his body in the way of Gareth McAuley. The ref has to be 110% certain to give it. It knocked us. Boro came into it. "Second half we create enough chances to win the game. It wasn't going to be our night. "It is a good group. We have brought Marc Wilson in. He can cover a number of positions. It is a ridiculous window. I am not a fan. It would be no good for TV and papers as it is a fishing friendly. To put games on the day of the deadline is extraordinary." Leicester’s players all got new contracts, they celebrated, they’ve taken their foot off the gas a little bit. Once you get into the habit of losing games, it’s very difficult to turn around. This season they haven’t turned up. And I think they know deep down that they were never going to win the league again this season. Villain: Arsenal fans moaning, try being a Villa fan, absolute nightmare. It was a 3-0 defeat to Brentford in the Championship for Aston Villa tonight. "We had to hang in there"
Sunderland manager David Moyes: “It was a really good point for us. We played against a top team and it was tough. We had to hang in there. “We made some chances in the first half but not many in the second, and it was a hard-worked and well-earned point. Swansea manager Paul Clement: "A massive result for us, to back the great away win at Liverpool up with a home win in a really hard game. They peppered our box with crosses. We showed big character. Our second goal was fantastic, a great counter. Performance was so-so, the result massive. We have done more than I expected. Since the heavy loss to Arsenal we have taken one or two really important games. On deadline day: "The Neil Taylor to Aston Villa deal that involves Jordan Ayew coming back to us is done. Mo Barrow has joined Leeds on loan, that's all at the moment. Borja will be with us." Manager Eddie Howe: "I thought we played with a lack of confidence today. We didn’t hurt them enough. They got a lot of men behind the ball and it’s up to us to find a way through. "We didn’t play well but we didn’t look like we were going to concede. I don’t think our problem was defensively today. "Usually at home we have a spring in our step but that wasn't there today and that’s concerning. "We had some very good chances we didn’t take, even though we played poorly." More from Chelsea boss Antonio Conte on Arsenal losing and Spurs drawing tonight: "The best thing is to see ourselves, not the others. We stay top of the table and that is a great achievement but it is important to focus on ourselves. "There are 15 games remaining and 45 points. It's important to draw against a really good team and now we must focus on playing Arsenal next week." Arsenal have start players and great quality, but they haven’t really improved over the last five years. Their title challenge is now over, and Arsenal are probably happy that the transfer window is closing, because would players like Mesut Ozil and Alexis Sanchez want to stay when they can’t win the league? Chelsea manager Antonio Conte: "I think at the end of the match we could have won. It was a very tough game, both games tried to play with intensity. I'm pleased. We saw a different game to when we played Liverpool and lost at home. "It's pity Diego Costa missed the penalty because he played very well. We had different chances to score goals, but we must be happy with the result and the performance because it is not easy to play away at Liverpool." More from Arsene Wenger: "We knew the solution was going wide but we were not patient enough and wanted to give too many long balls. We did not pass the ball quickly enough and we have to stick to our game, then we are always dangerous. "Where does it leave the league? We lost today and we want to respond in the next game. You can only have a chance if you win your games. I knew exactly what we were preparing for but we have to learn from tonight." Arsenal manager Arsene Wenger: "It was obvious we lost duels and were not sharp enough. It looked more mentally that we were not ready for the challenges. We were unlucky for the first goal which was deflected after a soft free-kick. It took us a while to get into the game, it was all us in the second half and unlucky not to get something from the game. "You look at the facts and we were beaten in the duels. When you play at home in our position, that is not normal. Everybody in the Premier League is strong physically and 90% is not enough." Jurgen Klopp trots out that old 'I'm not looking at the table until the end of the season ' line when asked about the title race. "I said before the game, and people didn't like it, but this wonderful, powerful club needs to keep its nerves," says the Liverpool boss, whose team had lost their previous three home games. "Not everything is bad because we lose. This team is outstanding in attitude so let's do the best we can and see where we end up at the end of the season. "The results tonight were good for us, but we must continue to fight." Leicester City manager Claudio Ranieri is not happy after his side's defeat at Burnley. Asked if he thinks there was a handball in the lead up to Sam Vokes' winner, he said: "Not thinks. WAS. It was for everybody - the television - but not the referee. He is the boss, didn't see and we lost the match. "We have to react as soon as possible." Our chief football writer Phil McNulty is taking your questions at Anfield. Ask away on the Match of the Day Facebook page here. Liverpool manager Jurgen Klopp, speaking to BT Sport: "I'm not sure happy is the right word to say how I'm feeling, but I'm proud of the boys because they did outstanding things against a really good side. We did really well. the result we can't change. We could have lost because it was a penalty. "In the second half we caused them problems, we could have scored a second time or a third time. I'm happy we could give this sign and create this atmosphere. It was a good performance." On keeper Simon Mignolet being caught out by David Luiz for Chelsea's goal: "That was world class from David Luiz we have to say that. You have to say we have to be prepared but he was surprised. "Even if he was prepared it would have been difficult to save it because it was hit well and right in the corner. "Two seconds before he scored David Luiz was stood next to me talking to Conte and drinking water on the touchline!" Joe Wedgwood: Getting rid of Arsene Wenger is just NOT the solution. 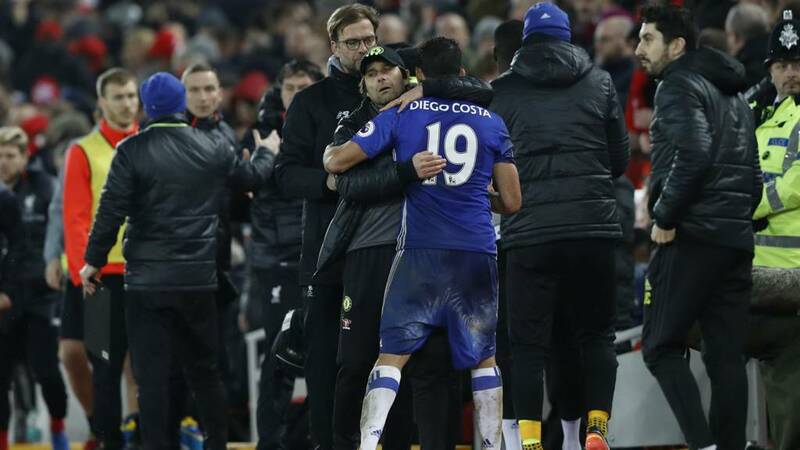 Jurgen Klopp is upbeat after seeing his Liverpool side avoid a fourth home defeat on the bounce with the draw against leaders Chelsea. Full quotes on the way. Quotes about the match and the title race that is, not the new team bus. Manager Sam Allardyce: "It’s relief for me. It [the first league victory victory] really should have happened in the first game at Watford and it’s been a long haul since. "The players today looked like what I would expect a team of mine to look like. You can't argue with the result with the amount of chances we created. They executed the game plan brilliantly today. "It’s a great result. It’s a first clean sheet, hopefully of many. It's three massive points away from home. I’m so pleased about the 'nil'. "The key today was keeping Bournemouth in front of us. We’ve let too many peole get through us and behind us recently and we had to stop that. I think Bournemouth found that frustrating."